Something very sinister and disturbing has been found in the popular PBS children's show Barney and Friends. Stereo TV broadcasts sometimes include a SAP (second audio program) channel, which is commonly used for bilingual broadcasts. This week, it was used for a very sinister purpose. The US was placed on Orange Alert upon discovering that Al-Qaeda had used the Barney show to send a message of terror. The main audio program was innocent enough. The costumed performers and several children were singing and dancing to a song about imagination, but on the SAP channel, Barney was clearly saying, "Allah Ackbar, little mujahadden! The time has come for intifada against the infidels. Our glorious Jihad has begun." 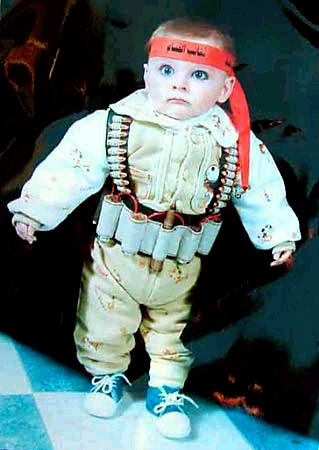 We were frightened to learn that scores of seemingly cherubic youngsters like this little boy have gotten his message of hatred for America, and are prepared to do the bidding of Osama Bin Laden, Saddam Hussein, and the rest of the Al-Qaeda terror network! A Whitehouse spokesman told us, "reports have been coming in from all over the nation about children going mad, and behaving outrageously, such as a little girl in Battle Creek, Michigan who hit her mother in the head with a plate, knocking her out cold, while screaming, 'Ah-la-la-la-la-la-la!' just as Arabs do when shooting guns into the air. A young boy in North Carolina broke his parents' TV, throwing his toys at it when Secretary of Defense, Donald Rumsfeld appeared for a press conference, the boy was allegedly shouting something in Arabic." 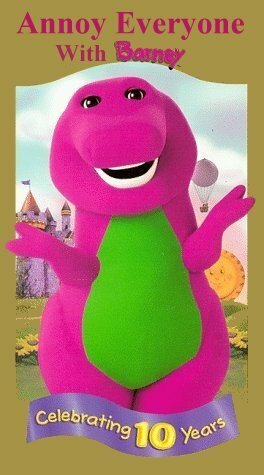 "President Bush," he went on to say, "has always thought that Barney was no good. When Jenna and Barbara were little, they went on and on about Barney the purple dinosaur. Our Leader told them that they were confused, that Barney was a man, and Dino was the purple dinosaur. When he said that, the twins threw a temper tantrum the likes of which none of Bush family had ever seen. He knew that any children's show that confused parents and upset children in such a manner had to be subversive, and would undermine family values." President Bush advises all parents and grandparents in America, all schools and day care centers, to stop letting little tykes watch Barney. The survival of America may depend on it.